Represented by a trident in which there's the cross of incarnation, Neptune is connected to our ideals, our mental conscious, our inner faith and our ability to give the best of ourselves. It expresses the ability for the beings to elevate their souls above the human condition. That's why it often has a religious or spiritual connotation. However it also represents our dreams, projections and illusions. Keywords: Faith, spirituality, inspiration, idealism, illusion, mysticism, psyche, dissolution, alcohol and drugs. 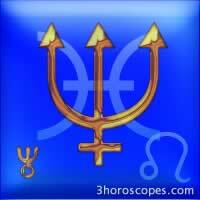 Correspondences: with the sign of Pisces (and also Leo). Body fluids and glandular system. Color purple, gas. Preacher, guru, religious chief, magician.